If you're not into wearing loud prints or bright colors, introducing those things in miniature doses can make for a fun change of pace. Mixed prints and colors were everywhere at the spring collections, which ended last month, and a few designers showed head-wraps and/or had their models' hair styled with bits of fabric woven through. 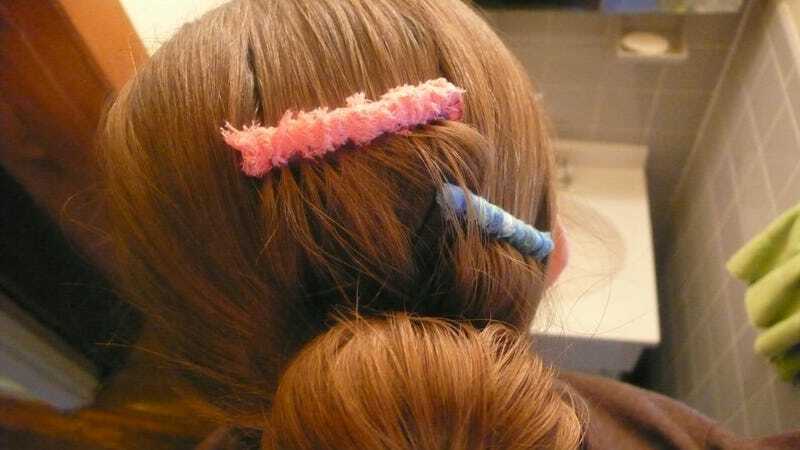 Simpler than plaiting a piece of printed cotton into your bun, however, is making a jazzed-up hair comb or barrette that you can just stick on top. This week's DIY will show you how. You'll need everything you see here, plus a large sewing needle. From top left: a hot glue gun, or some super-glue or similar; ribbon, strips of colorful fabric, and/or bias tape; a toothbrush; and some cheap plastic hair combs from a drugstore. First, using the toothbrush, fray the edges of the bias tape and/or the strips of fabric that you're going to use to wrap the combs. When your edges are appropriately frayed, put a dab of hot glue on the edge of one of your combs. Press one end of the first ribbon into the hot glue; pull the tail of the ribbon through the first and second prong of the comb. Wrap the ribbon around the head of the comb, between each set of prongs, covering the end of the ribbon. Add another dab of hot glue, for good luck, at the center of the comb. Sometimes one layer of wrapping isn't enough. So, when you reach the end of the comb, turn around and wrap back to the start. And when it's time to hide the tail, turn the comb over, push the needle under and over a few of the ribbon wraps, and then insert the tail into the eye of the needle. Put a dab of hot glue on the comb head, and pull the needle through, dragging the ribbon trail through the glue, and over and under the wraps. For a final touch, fluff up the frayed edges with the toothbrush one more time. And enjoy your new combs, which are now 100% prettier and more colorful than the old. Alternatively, if you don't like the look of fabric-wrapped combs, you can also use jewelry wire and beads or other metallic, dangly things to wrap. This lady, for example, made an awesome set of hair combs with wire and beads for her wedding. If you wanted to get a little wilder but stay in the vein of fabric and sewing, you could add tassels, buttons, fabric flowers, or other 3-D haberdashery elements to your combs. The fact that this DIY is so easy makes it almost endlessly adaptable. If there's something you'd like to see as a DIY project, you know what to do. In the meantime, to check out past DIYs — including how to make a pair of shorts, how to do basic leatherwork, and how to paint your nails with stripes — click here.